Notice how in Dec. 2005, silver broke below the trend-line, then the trend-line was resistance during the remainder of the dip. 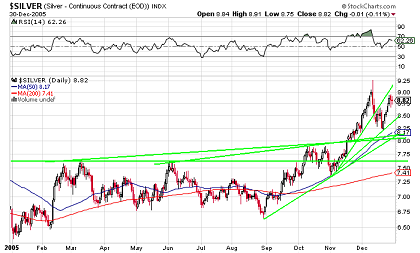 Then notice how silver recently broke below the trend-line. Thus I expect silver to reach no more than about $24, before it falls again. Notice that the total dip in Dec. 2005 was from $9.25 to $8.25, which was -10.8%. The recent intra-day high for silver was about $24.90, so -10.8% would be $22.21. 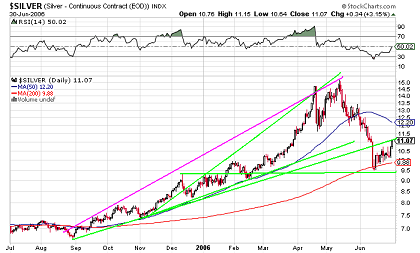 Notice that in Dec. 2005, silver came down from 18% to 2% over the 50 days MA (blue line). Recently silver has come down from 21% to 10% over the 50 days MA (blue line). About 1 - 2 weeks before we reach final bottom of this dip, so 50 MA will be about $21.75 by then, so +2% indicates a bottom at $22.18. So that means the current (green) trend-line which was recently broken on the downside, is projecting a silver price of $46 by March 2011. And notice in May 2006, the $15.25 peak price was 3% below the trend-line, so that means we can expect a peak price of $44.50 in March 2011. Then the price will crash to $24.90 again. short bio, I have published articles on FinancialSense.com, Gold-Eagle.com, SilverStockReport.com, LewRockwell.com. I am the sole or contributing programmer of numerous (some million+ user) commercial software applications, such as Corel Painter, Cool Page, WordUp, Art-O-Matic, etc.. I have an education in engineering and math. Disclaimer: My writings are my personal opinions, not to be construed as statements-of-fact. Do you own research. Licenses to think and communicate have never interested me too much, so I am not a licensed research, journalism, investment, legal, nor health professional. Please consult the proper authorities for all matters covered in my writings. I disclaim all liability for what you do after reading my writings. No one can predict the future, and if there is a physical world investment that never loses value, I haven't found it yet in my 44.1 years here on Niribu. according to your views mr.henry moore its happening in silver.i was saw your views just two days before. why i don't see its 6 months before.i am in sale of silver from 20 doller. so will you please tell me that is it happened that you say that its comes again at 25 doller. Honestly speaking I will read on average 10-15 on gold/silver news on a daily basis. After reading your latest and fascinating article, I figued I'd check what else you have penned. To my amazement, your silver price projection has been 90% correct, and thats only because im unsure whether the $25 low you forcasted hasnt already happened a few weeks ago with silver hitting $26. Since I do not want people to idolize speculation unrealistically, I will make one final comment. I do have a current expectation about silver. But I want to caution readers that no speculator is correct 90% of the time. Over the long-run, the best short-term market timers are apparently correct roughly about 55-60% of the time. If I am not mistaken, Nadeem had stated this rough percentage in one of his past comments. If speculation is longer-term, the probability of success can increase, if the speculator's research is impeccable, e.g. Jim Chanos's successful Enron and China short bets. The fundamental paradigm that caused me to make that silver speculation was noting that we were in a reflation (actually an acceleration of debasement) from the 2008 lows that was likely to run out-of-steam and require another deflationary scare in order for the politics allow another increase in the rate of "socializing defaults", i.e. printing money and other forms of re-distributive debasement. Then I looked at the patterns of the prior cycle of reflation from the dotcom market correction lows, to the top and crash of silver around May 2006. I also saw in various charts that the cycles between reflation and busts were accelerating, as the volatility in the financial system is accelerating. My theory is this is because the free market wants to deleverage quickly, but the politics are against deleveraging, so there is this accelerating see-saw between pumping more air in the balloon and the free market making ever bigger holes in the balloon (the bond vigilantes, etc). It might be wiser to buy gold first, but the more short-term timing one tries to do, the less probability of success. I would recommend some diversification into gold. It is usually wise to have some alternative speculations in play, so one can take profits at different times and profit on different scenarios. Also the Middle East is a powder keg, with the next action possibly to be against Syria, which might cause tension with Russia and China. 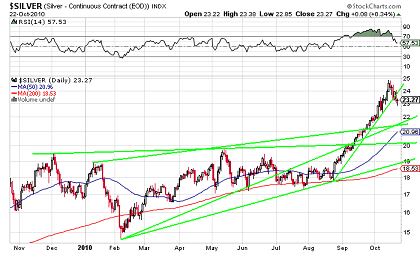 I expect the ratio of gold to silver price will fall from 50 to below 30 over next years, probably as low as 15. So if you intend to hold gold long-term, silver can potentially give you double or triple the return, assuming you can hold through the volatility and sell when the ratio is low. Sprott is reportedly planning to buy another $1.5 billion of physical silver, which he did right before that that recent runup to $48. Or you can try to sell silver when ever it gets highly overbought. The psychological problem is that 'silverbugs' tend to get over confident and expect higher prices, when silver is moving up too fast, and thus they don't sell (or at least trade for gold). Or they get dejected and sell when the price is low or ratio to gold is high. That is the time to buy silver. A smart trade when silver hit $48 in late April, was for gold at $1500. Then seeing gold get overbought at $1900 and the mainstream TV analyst calls for $2500 before end of the 2011(e.g. JP Morgan commodities guru), sold and repurchased both at the lows in early October. Sites such as this one provide updates on overbought and oversold conditions. Realize that the more uncomfortable an analyst is with very high beta investments such as silver, the more likely they will buy less close to the low and sell less close to the top. For a silverbug like myself who sees a long-term bull market for silver (probably at least to 2018), I am willing to hold if I miss a turn in the market, so I don't mind holding for the next extreme if I miss one. Off topic: I still see in recent comments on this site (and else where, e.g. protesters) that many (most?) people think regulation is a solution, and lack thereof was the cause of the current debt crisis. Or that free market capitalism somehow was tried and failed. As I explained in my most recent article, for as long as humans want to borrow money in droves, no amount of regulation will be able to escape the political capture, that comes from a fractional reserve system. And the widespread use of debt financing, mathematically requires fractional reserve banking. But one thing I have learned recently is that it is a violation of the free will of others to rebuke them constantly, when they make such comments. They have to learn from experience of repeated slavery, that regulation is not the problem nor the solution. Hey isn't it great that we have the internet and can research and share knowledge so efficiently? Let's focus on the positive future ahead that comes from technological advance. Think of this, even the poor today have a better standard-of-living than Kings of Yore. Technological advancement is the reason. Okay time for me to STFU (joke) and do my core skill (programming). So I will let this be the last. Disclaimer: The above expressed opinions and citations are my own and not necessarily endorsed by this site. My opinions and citations are shared as alternative perspective for your entertainment only. I cannot prevent you from deeming that my writings are educational. I am not a professional advisor, thus I claim safe harbor and I am not responsible for any outcomes, mental state, decisions or actions you experience or make after reading this essay or cited sources.